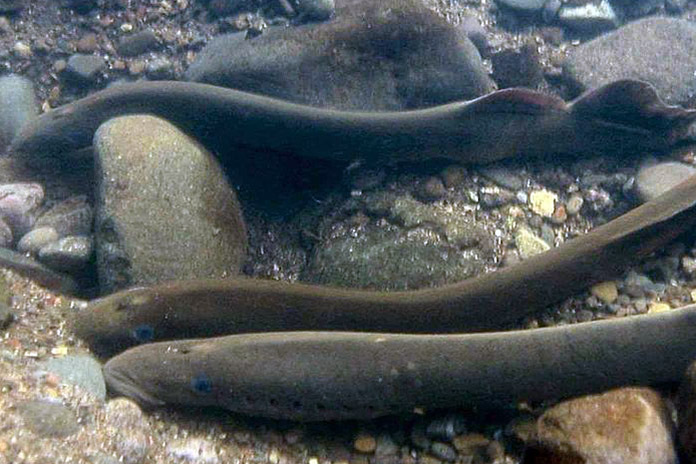 After nearly going extinct in the Umatilla Basin, Pacific lamprey are returning to the Umatilla River in record numbers. From the late 1960s through the early 2000s, lamprey were functionally extinct in the Umatilla Basin, and less than five years ago, only a few hundred Pacific lamprey returned to the Umatilla River each year. However, through efforts such as adult translocation, scientists with the Confederated Tribes of the Umatilla Indian Reservation have counted more the 2,600 of the ancient fish migrating up the eastern Oregon river to spawn this spring. The Confederated Tribes of the Umatilla have worked for nearly 25 years to increase lamprey numbers. The Bonneville Power Administration has funded most of the tribe’s lamprey projects since the early 1990’s, with much of the money going toward lamprey research and improving instream passage. Over the past 10 years, Bonneville Power Administration ratepayers have invested just over $5 million in the Umatilla Basin for lamprey. Pacific lamprey spend the majority of their lives as tiny larvae living in Northwest streams from three to seven years before migrating out to sea. Adult lamprey have a sucker-like mouth that allows them to be parasitic while in the ocean. They attach to fish and other marine mammals for feeding. Lamprey usually live in the ocean for one to three years before returning to fresh water to spawn. Similar to salmon, lamprey die after spawning and their carcasses provide marine rich nutrients to streams.